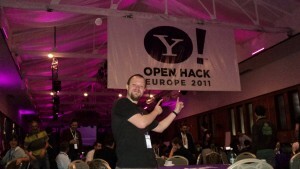 After a couple of days of almost no sleep, about 6 Red Bulls and an app, Yahoo Open Hack Day Europe 2011 was over. Initially I only wanted to go to tech talks. Later I though that I should go as hacker because I didn’t what to miss anything from the event, but not to present a project. Ultimately I was chosen to present the project. Everything began at 7 am, when a colleague came to pick us up in time to have a cup of coffee before the event. We were 6 attendees so we thought that we can split into two teams. At about 9 am we’ve arrived at Crystal Palace Ballrooms. We were greeted by the “crew” in green t-shits, who have guided us to the registration offices. Once registered we started looking for a table in the room where all 6 of us can sit. In the room there were about 350 people who came for both hacking and tech talks. Nervous, I approached his table: “Mr. Crockford?”, he saw the book and smiling he answered “Hey, my book!”. Nervously I gave him a pen and asked him to give me an autograph. I know it sounds ridiculous, but for me to meet someone of DC stature, about who I’ve only saw presentations at Google and Yahoo! and read his book, to meet face to face, to have the opportunity to ask for an autograph and shake his hand was like meeting a famous actor. I’ve returned to our table and I’ve bragged to everyone with my autograph, I thought that the first item on my agenda was achieved. I was very happy to work on an app without thinking at backwards compatibility. 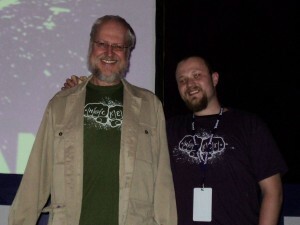 At about 18:30 there was another talk by Douglas Crockford “The JSON Saga”. I saw this talk before on developer.yahoo.com so I thought is not going to be very exciting for me. But it turns out it was quite different. 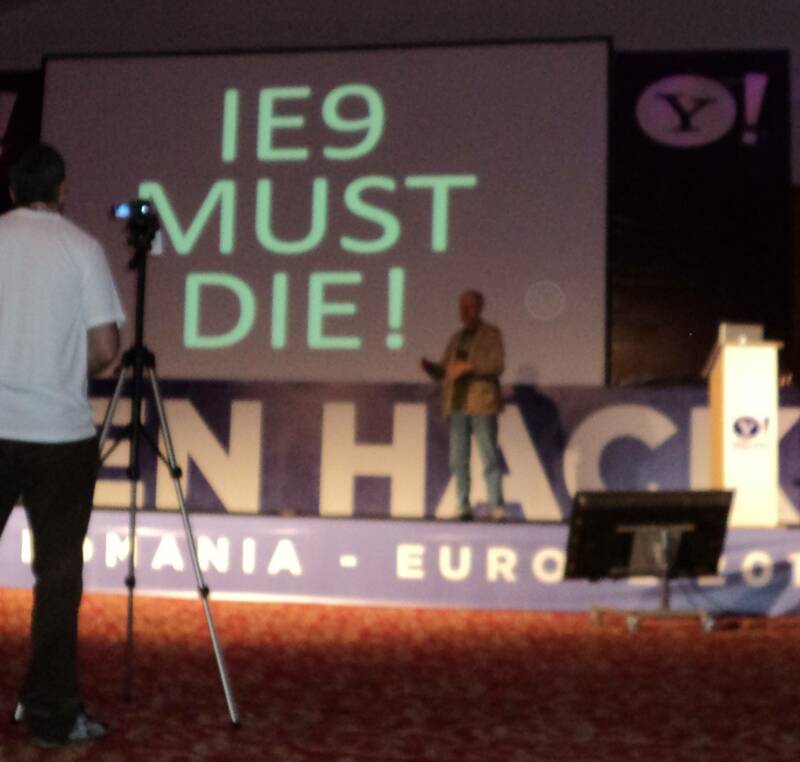 An interesting part was when one of the slides said “IE6 MUST DIE!”, a very good point, but then… “IE7 MUST DIE!”, then 8 and 9. At some point I was wondering why didn’t he simply write “IE MUST DIE!”. The answer came on the next slide “IE10 MAY LIVE!”. IE10 is the only Microsoft browser that implements “ECMAScript 5: Strict Mode”. The recorded talk can be found at: http://www.youtube.com/watch?v=NXiAKPTDXk. After the talk I’ve asked Douglas Crockford to take a photo with me, one more reason for me to brag that I was to this event! This talk was the last one until the end of the hackathon. After that was dinner and a very long night. After several hours of intensive coding we made a visit to the games room, where waiting for us were: a XBOX, a WII, a Ping-Pong table, Fuzzball table and a pool table. During the night we made serveral visits to the game room to relax and stretch after sitting too long on the purple bean bags. Sometime after midnight the other team dropped the project because they got stuck in YUI, so only our team remained active. After 3 am few colleagues began to fall asleep on the bean bags, but in my team sleep was not an option. To prevent me from sleeping I drank 2 or 3 RedBulls. The project was starting to take shape and I said to my self that I will not sleep before we have the first version running. At about 5:30 am I blinked from a moment and felled asleep with my hands still on the keyboard, for about an hour. One of the most relaxing nap I ever took in my life. In the morning a new espresso machine appeared to keep us alive for the remaining time, so we continued with new strength. After getting to a working version it was more of a continuous playing with small brakes to fix the bugs that we found along the way. I think that it seemed fun enough that even Ted Drake came and had a game with us. After 24h of hacking the end was announced and we had to go and register. I was going to present, I was overwhelmed by the moment. I took a number, set up my monitor and went to eat. We has a little issue, the game was working fine using websockets over local network and we didn’t know how we were going to do the presentation. After some running around we managed to figure out the details but not the presentation. I realized I was in front of 300 people with no speech and with a game made literally over night. I finished very quickly and I can’t really remember what I said, the only things I could see was the spotlights in my eyes and I was so nervous that I thought I was going to faint. But I think everything turned out ok.
1.5h of presentations by 50 teams followed. While the jury deliberated we went outside and had a brief conversation with Luke Smith, and a not so brief conversation with Reid Burke which during the night helped us with our project. We’ve started our conversation with Reid on node.js and ended with YUI and why is not very popular. 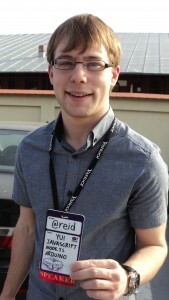 I found out that Reid is only 22 years old and it’s been with Yahoo! for 3 years already. At some point we told Reid that we didn’t like YUI because it has such a different approach then jQuery, but he openly answered all of our questions explaining why they approach things this way. Maby if YUI would better highlight why there doing some things so different it would become a much popular framework. During the awards Anil Patel (the event host) insisted that presenters should stay on the bean bags in front. And because the jury was getting late Anil told us some funny stories about what happend at other Yahoo! Open Hack events. And because the jury still wasn’t coming back from deliberation he sang us some Abba. 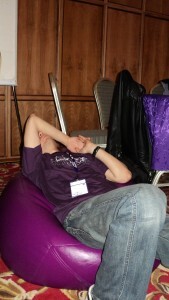 After the awards we found out why it was so important to sit on the bean bags, presenters would take the bean bags home! The after-party followed, but we were to tired, so after smoking a cigarette and drinking a cup of wine we ended our trip at Yahoo Open Hack Day Europe 2011! As a conclusion, the accommodations were almost perfect, no detail was left to chance. I overheard a discussions that they even prepared umbrellas in case the weather would turn bad. Is about the phone’s calculator. I have a HTC Desire with Android 2.2. My default calculator app that’s called simply “Calc” amazes me. Very rarely happens to need to use it, end even less I’m using it with fractional numbers, but when I’m actually using it I tend to forget that it has an issue. Any elementary school student knows that the result is 0.1. It’s about float, and I assume that the difference comes from the digit number displayed on the screen. In both cases IEEE 754 standard is used.